By train it takes between 12 hours 55 minutes and 16 hours 45 minutes to complete the 840 km journey from Bhopal to Mumbai depending upon which train you take. The train services listed below all depart from Bhopal Junction Railway Station and arrive in Mumbai at Chhatrapati Shivaji Maharaj Terminus. There are 5 train services from Bhopal Junction to Mumbai Chhatrapati Shivaji Maharaj Terminus, 3 of which operate every day of the week. Fastest Train: The fastest train from Bhophal Junction to Mumbai CSM Railway Station is the Gorakhpur – Mumbai CSMT Jansadharan SF Express (Train #12597) departing at 23:20. Slowest Train: The slowest train from Bhophal Junction to Mumbai CSM Railway Station is the Amritsar – Mumbai CSMT (Dadar/Pathankot) Express (Train #11058) departing at 11:20. Use the Search Form below to buy your train tickets from Bhopal to Mumbai. Bhopal Junction Railway Station is 2.4 km by road from Bhopal Talkies Square. Mumbai’s Chhatrapati Shivaji Maharaj Terminus is 4.4 km by road from the Gateway of India Monument. 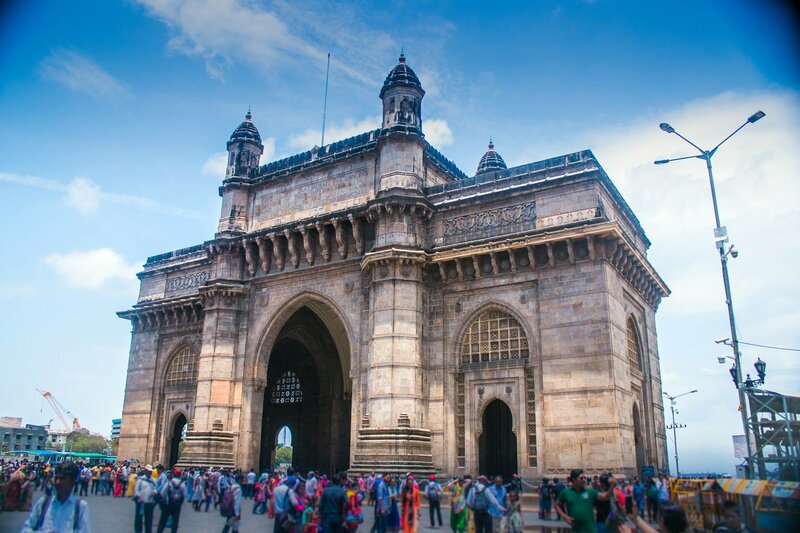 The Gateway of India Monument is one of the most recognisable landmarks in Central Mumbai. The monument was completed in 1924 to commemorate the visit of King George V to Mumbai in 1911, which was the only visit by a reigning British Monarch to India during the entire time that India was part of the British Empire. Near to Gateway of India is a jetty and the monument was the first thing many British visitors saw when they arrived in India by sea for the remaining period of British rule from 1924 to 1948. The last symbolic occasion for British Empire in India that the monument served was when the last British troops marched through the Gate of India on the 28th February 1948 on their way to take a ship home marking the end of British rule. The Gateway of India took 4 years to construct from the time the foundations had been prepared, a job which itself took 4 years to complete and involved the reclamation of land and the construction of a large seawall. The monument is 26 metres high, and features 4 turrets and two large halls at ground level on either side of the arch. The Gateway of India was designed by Scottish architect George Wittet. The design features a number of different architectural style. The overarching concept is that of a Roman style triumphalist arch, with an archway which is reminiscent of Muslim style buildings in the North of India and decorative motifs on the exterior of the building which are similar to the traditional Hindu architecture associated with Southern India. The design of the Gateway of India is powerful symbolic statement bringing together the two major religions of India together and combining them in a structure celebrating the rule of the British Empire over India.